I have been nagging my esteemed colleague, Dr Grump, to start her own blog for some time now, and today she rushed into our office in a state of great excitement. 'I've done it!' she said. 'You've got lipstick on your teeth.' I said. 'See that?' the man sitting next to me last night said, rolling up a trouser leg. Fortunately the light in the bar was dim and I could only just make out the scars. Gaius named himself after a real Roman soldier. He passes his stone every time he goes into the Museum, and Gauis (II) has researched his history. The original Gaius came from south west Spain and joined the Roman army aged 14. He died in Chester aged 28, and Gaius II believes that by taking his name he is paying homage to him. I first encountered Gaius II as one of the bearers of my friend Mike's coffin. All the bearers were dressed in the gear they wear when they march, in formation, around Chester: sandals, short toga, armour, I can't really remember the details, my mind was elsewhere, but I was aware of them there. It could have been blackly comic, but in fact it was the opposite - very dignified. Becoming a Roman soldier, for Gaius, has been a spiritual experience. He has adopted the faith, at least in part. On December 18th is the feast of Saturn - a pagan festival which predates Christianity. On that day, according to Gaius, the slaves were free, and to celebrate Gaius and the other soldiers are going to march with lanterns through the streets before feasting and dancing at the Groves. On other days, he and the other Roman soldiers have visited Roman temples and Gaius has baptised himself in an underground font. 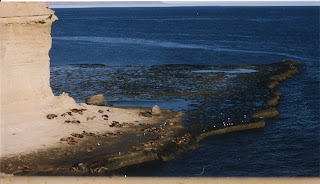 Once, he recalls, seven of them were visiting a temple on a pilgrimage together and as they walked through a field seven bullocks made way for them and bowed their heads, while overhead an out-of-season flock of Canada Geese called out as they flew. 'They shouldn't have been there, then,' says Gaius, 'Canadian Geese are winter birds and this was August - it was all a sign.' Then, later, when they came out of the temple, there was a double rainbow, and they knew they'd been blessed. Gaius Lucius Cadarus (II) is well-built, almost burly. There are tattoos over both arms, and the role of Roman soldier suits him. Since becoming a soldier he has researched Roman history and seems to be hungry for information about the period. His life has clearly been transformed and enriched by an incident that, for a few hours, had looked like it was about to destroy it. I spent a fascinating half hour talking to him. The English Pen newsletter has come in with an interesting article by Will Self on W G Sebald. 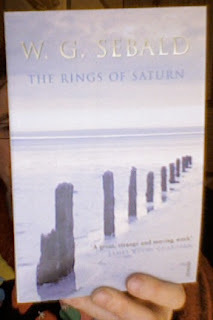 The Rings of Saturn is something I am saving for myself as a treat when I have eventually finished this editing. 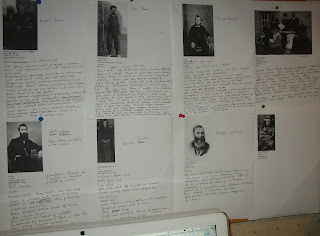 I have gone back through the book modifying one of my characters and am now wondering about the depth of another. It is a bit like shaving the legs of a chair - a little off one, set it down, and still it wobbles - so that means a little off another... and around and around until, eventually, the chair has no legs at all, and all I am left with is a blank page. I am on page 255 now, and think I might proceed now to the end before going back to the beginning again. 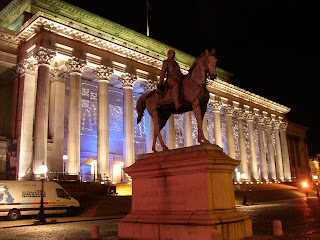 So up the steps, such a grand entrance, and I come across several polite bouncers in suits, and several more inside. 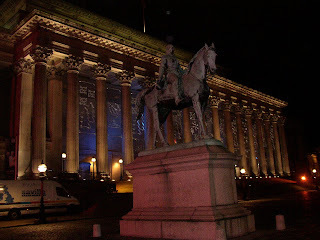 'Is this St George's Hall, I've come for a book launch...' and I am directed to the side where things are a little more modest, but only just. 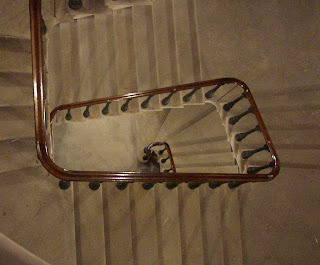 and up some steps, where there are people milling around in frocks and suits, and the intricacies of name-badge and cloakroom and dispelled with, and so into a hall...where I see a few people I know - the crime-writer Margaret Murphy and the wonderful Murph (who only remembers me when Margaret reminds him about halos around the moon), and the equally wonderful Ray - husband of my writer-friend Jan Bengree. 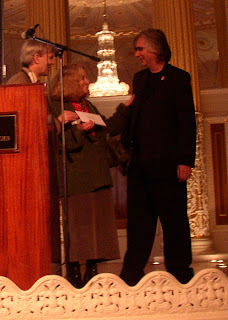 being presented with her prize from Phil Redmond (TV writer and producer) and Martin Edwards, the crime -writer (and lawyer) who was launching his latest book - Dancing For the Hangman which is a fictional recreation of the dark deeds of Dr Crippen...which sounds of great interest to this Hodmandod. It is all part of the Liverpool 2008 year of culture, so a very auspicious occasion and many congratulations to Jan! She is amassing a goodly selection of awards for her lovely writing. 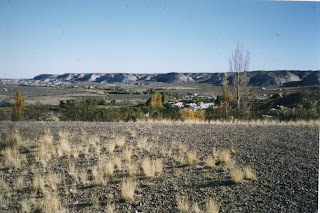 I've decided to update my website (prompted into this by a phone call from Dipika at Pedalo - my web-designers) and thought I'd put something about the research for my Patagonia book on it. About five happy hours later I found the photo I was looking for - and also this one. 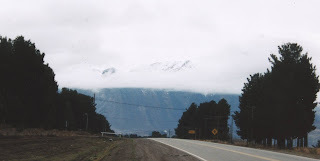 It was taken outside the hostel I stayed in the Andes, at a place called Esquel. If you look closely you can see the tops of the mountains - they are are so high they seem to merge with the sky. The editing has stalled for a few days, and I fear I won't get much done today since I am going out tonight (which necessitates much primping and preening because, as a hermit, I have obviously got out of practise). Jonathan and Anne both have interesting stories about horse-racing and betting - on different sides of the world. It is strange how just a slight change in emphasis gives an entirely different impression. 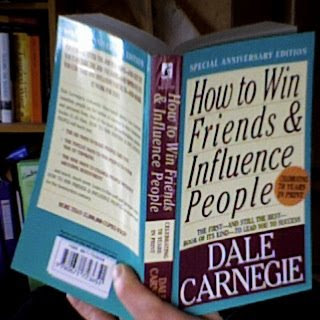 To my great surprise I liked 'How to Win Friends and Influence People' very much. I went through it quickly, but quite thoroughly, making notes after each chapter. Because I have been on this planet quite a long time now I felt I had discovered some of these rules for myself already, but still it does no harm to have them reinforced, and also be reassured that these are the 'right' thing to do - and why exactly they are 'right'. Of course there are other rules which are new to me, and so feel I have learnt a lot too. The main conceit of the older book was that if you please people, and make them feel happy and important - then both parties benefit. The more modern version said the same thing but in a more bullish and manipulative way. For instance it advocated paying compliments to people whose job is to provide a service, hinting that if they kept it up their boss would be informed - and have the requisite letter at the ready. Everything was constructed around this sort of rather calculating attitude. As far as the research for my novel is concerned, I think I shall find both books of great use, and can think of ways of incorporating their ideas already. 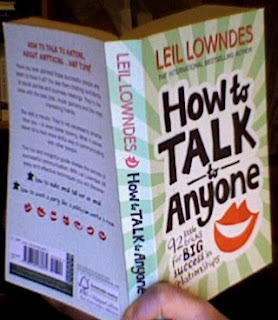 The older 'How to Win Friends...' has general guiding principles; whereas the 'How to Talk...' book has more specific examples. 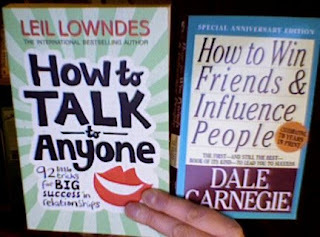 The 'How to Talk...' book is easier to read with modern examples; but the 'How to Win Friends...' is perhaps more witty and has a kinder overall philosophy. Basically, I think, the message is that if you can somehow manage to make other people feel important, valued and respected then they will come to like you and respect you. These books go into the detail of how to accomplish this in everyday life. The first print run of this book, in 1937, was a mere 5 000 copies but edition after edition was printed, and on the back it proclaims that more than 15 millions copies have been sold. I suppose it is the granddaddy of the Lowndes book I read yesterday, and I notice that part four is called 'Be A Leader' so it may be more even more useful to me. There are instructions at the front: I am to read each chapter twice; I am to stop frequently and ask myself questions; I am to underscore each important idea; review the book each month(! ); and apply what I learn at every opportunity. However this, and the rest of the instructions, are not really applicable to a virtual hermit such as myself. I have spent the day reading and making notes from this (slightly amoral - in my view) book. One of my characters is a leader and I have been trying to think of how he could be charismatic. I had looked up papers on charismatic leaders (e.g Max Weber's Theory of Social and Economic Organisation) but found these were written more from a sociological stance, rather than a psychological one. 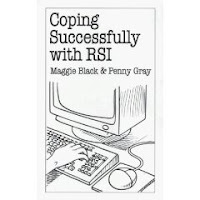 I needed details - and then it occurred to me to try a popular self-help book like this. Charisma can be either natural or learnt - and there can be several motives. My character wants to lead, and has some natural charisma, but it is only when his motivation is honourable - i.e. he is led by love, rather than is driven by revenge - that he is truly successful. Half way through my novel he is changed by something that happens to him to help him to see this, hence my need for this book. I woke up this morning realising that one of my minor characters isn't, in fact, terribly minor after all, and therefore am going to have to go back, almost to the beginning, emphasising him a little more. And his wife...dammit. I am hoping this will just require a little tweaking. In which Silas makes a journey of discovery. A day of mainly lopping out words. I have had to be ruthless...and shall have to be ruthless again tomorrow. The chapter I am working on at the moment needs to be very much pruned. I don't think I could see that a year or so ago - but I can now. Page 181 (now of 388). ...and the leader of the colony, Edwyn Owen, is deposed by peaceful coup. On page 172 out of 392. Over two thousand words painfully excised from manuscript. 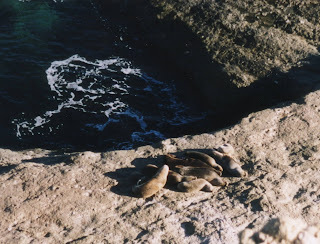 In which Silas contemplates the great brown sea lions. 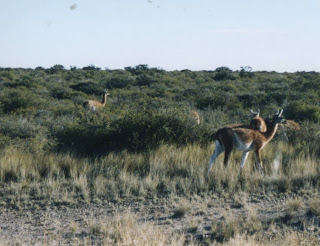 with dry soils and strange animals like these guanaco. I am now on page 139, and happy with my progress. In which Silas crosses the desert. 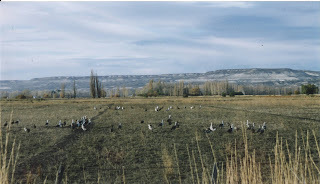 ...but I have got to page 98 in my editing of my Patagonia novel. I feel have 'got into' the book again now - and consequently am enjoying myself very much. My hero, Silas, has just managed to cross thirty miles of cold wind-swept desert. I am mainly taking superfluous parts out, as my editor advised. Even though I have scarcely moved from this chair I am oddly exhausted. Martin Fenner, of Gobbledygook on the Nature Network has started science blogging meme - and although this blog is not strictly as science blog, I have decided to have a go. My life as a writer - which means anything goes, I guess - but includes snippets from my research, reviews of books I've read, interviews with authors and other people from the publishing business, the odd poem and very short story, and generally my thoughts on the world around me. Also, a character called Dr Grump sometimes makes a guest post when I let her, but I have told her to start her own blog on Nature Network, and she says she will, when she gets a chance. Other people (excluding interviews and reviews of their work). I also tend to avoid politics. Yes, and have - though often I miss it (most days I also consider leaving the world of writing - not because I want to, but because it seems so hopeless at the moment). I have no idea - I can't imagine not writing, which is why I stay. 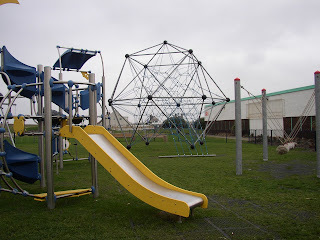 More people will be doing it, there will be more 'gadgets' and might be more interactive. Well, a Nobel prize winner once commented on something I'd written, but the best thing has been meeting a lot of interesting people, including some that have become friends. Yes, sometimes I've felt I've exposed myself too much - but that, I think is part of the nature of blogging, and makes it more interesting. Around 2006, I'd say - through Maxine. I have no colleagues - as a writer I work alone. 10. 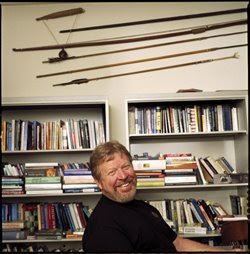 Extra credit (from Henry Gee): are you able to write an entry to your blog that takes the form of a poem about your research? Three years ago today. The eleventh day of the eleventh month. I know I should be thinking about fallen men in fields, and poppies, and the horrors of war. But instead I think of Huw, and how many other battles we all have to fight. Anyway, food at the art gallery (which shall remain nameless) was very bad: dried up bread rolls, unbearably (and mysteriously) hot spicy soup which made our eyes water and noses run, even drier cakes and it took so long to pay for our tea that by the time we took it to our table it was cold. 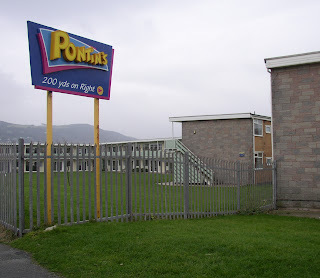 Null points - as they say in all the best Eurovision Song Contests. 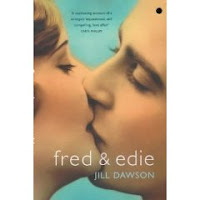 However, I did read a book: FRED AND EDIE by Jill Dawson, which I loved - a mainly epistolary tale about a woman on trial for murdering her husband ... and not because he'd made her go and see questionable artworks in unfavourable conditions. 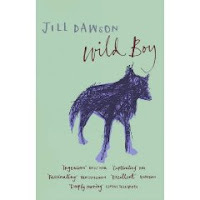 At the end of it I briefly considered whether I preferred this book (which was short-listed for the Orange Prize and the Whitbread (now the Costa)) over another of her great books, WILD BOY, and decided I did not. Although both books are excellent, WILD BOY haunts me still - it is very clever, moving and made me reconsider few things I thought I knew. Ah well, back to Quantum Theory Cannot Hurt You: I am, of course, learning a lot. It is the Salavador Dali of science. Nothing is what it seems. Concepts seem to flow and distort like semi-liquid clocks...and I have just read an explanation of why quantum mechanics only applies to the microscopic world, and why a photon can be at two places at once. Marcus Chown made this all seem like prefect sense when I was reading it, but unfortunately, now I try to recall it, it doesn't. It was something to do with a photon having the properties of both a particle and a wave ... and that if you take a single photon, since it is a wave it can have two components, so one component can go through a glass window while the other component is reflected back and so - voilá - two places at once. Then, again, looking at it from the point of view of Everett's multiple universes, one component is in one universe and another is in another, and when they finish travelling, in order to see them they must come together in a sort of constructive (or destructive) interference ... but these interferences are vulnerable, delicate things - easily degraded by the environment, even the act of looking at them can extinguish them ... which is why, in the macroscopic world, where everything is necessarily observed, the interferences are destroyed, and so nothing, in quantum mechanical terms, can be measured ...argh...back to Marcus, who makes much more sense. Added later: For another take on 'this sort of thing' see Gordon McCabe's hilarious review of the film 'Quantum of Solace'. A Little (En)Light(ening) Reading for the Weekend. A couple of new acquisitions landed somewhat unexpectedly on the Hodmandod doormat this week. 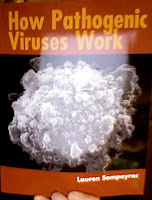 How Pathogenic Viruses Work by Lauren Sompayrac and Quantum by Manjit Kumar. I've dipped in and they both look good. In fact I've read Sompayrac before, and know that I really like his style. 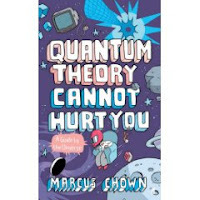 But tonight I am going to retire with Marcus Chown's Quantum Theory Cannot Hurt You, again. 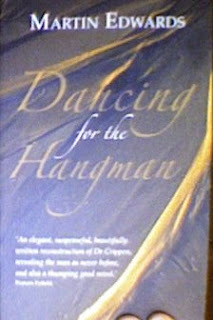 I've read the first few chapters (which were excellent) then been diverted, but it is time to indulge myself again now. 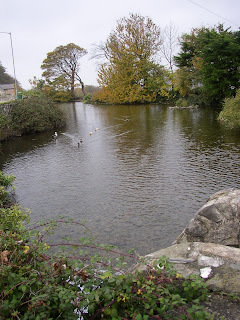 and then a mill-pond (the mill, alas, tucked away behind 'No Admittance' notices) with dirty-looking ducks. 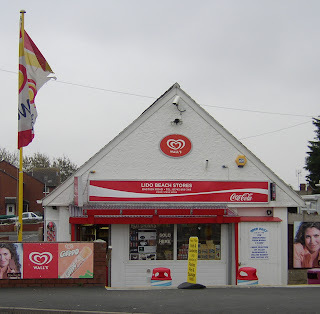 converted so easily into curry houses; the arches above windows conveniently close to the curves of an Indian temple, and the listing of evening service and morning Sunday School quickly replaced - with the flick of a sign-painter's wrist - to the prices of a good tandoori. 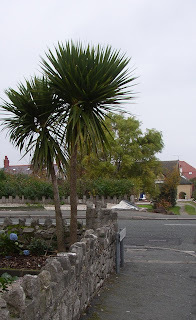 with palm trees and lidos and beach huts which seem sadder still under grey skies and the cold damp air of November. 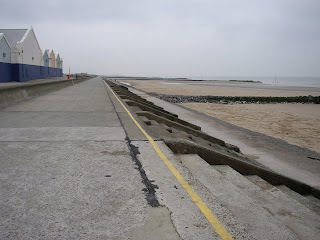 with the impressions of waves set hard enough to turn my ankle. 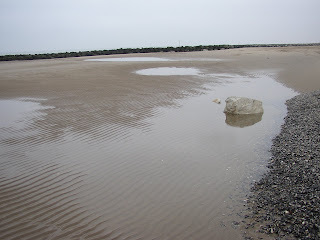 And as I limped from them I thought again of all the ripples I have seen preserved in sandstone, and that moment: the one when something catastrophic happens, when everything changes - a sudden shift of the tide - and these tiny undulations are fixed, like these could be now. Which takes me, quite neatly to this. It is a shock to come upon it and a shock to see how far it stretches behind its prison-like perimeter. 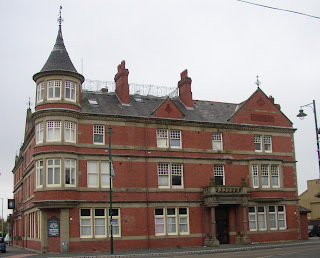 Its resemblance to secure accommodation is striking. Are the bars to keep people out - or in? I imagined a few months from now: the noise, the enforced jollity, the group entertainments and the organisers with their determined grins. and life can continue unguarded. 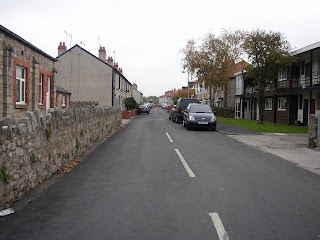 Back in the town there is the bustle and cheer of a thriving and affluent place. The shops are full. The faces smile. Maybe it is a little like blanking out pain or grief. It is there - but there is no need to dwell on it. 4.20am. I went outside. The air was still and cold. It took a long time to seep in beneath the warmth of sleep that enveloped me still. Nothing moved. 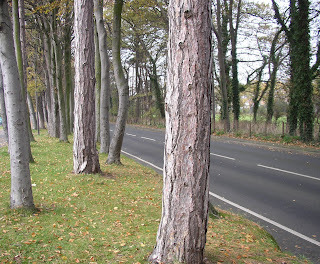 The only sound was a distant hum of cars along a motorway I can only hear when the rest of the world sleeps. A single lit window. No fireworks. No shouting in the streets. What now? I made some instant coffee and took it back to my desk and looked again at the map with its new swathes of blue. I listened for a while to hoarse voices and strained smiles, and then I wondered if Barak Obama was thinking of his grandmother. Many thanks to Dave Lull (who used to blog by proxy, here, and whom I really meant to mention yesterday, but got caught up in 'stuff') for this wonderful piece on snails by Donovan Hohn. How to turn the word 'Clare' into the word 'sense' changing one letter at a time. Ha - it can be done...although it is a long and tedious business, and has taken Hodmandod Senior 10 moves. Writing a needless blogpost about this is the ultimate in irony, really, isn't it? 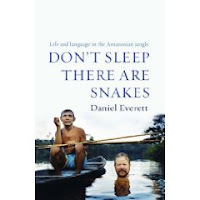 And I did so much want to write a review about a fascinating book I've just finished reading: DON'T SLEEP THERE ARE SNAKES by Daniel Everett. 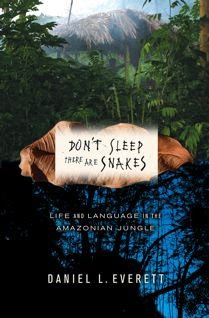 I know the linguistic conclusions are in dispute - but it is fascinating for all sorts of other reasons too. I am going to try and write about it on my lap top which I think might be easier.